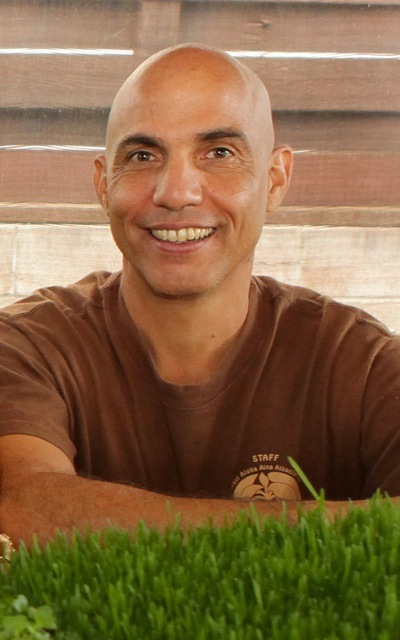 A few days ago, we caught up with TEDxMaui 2012 speaker Vincent Mina. Vincent is well-known around Maui – not only for his farming, but for the support and education he brings to farmers throughout Maui County and the state of Hawaii. Please take a moment to get to know him a little better. What drives you to do the work you do, Vincent? As a farmer I work with the soil. It’s the medium we grow our food in that acts as medicine for our bodies. As an agriculturist I want to better understand how to be in relationship with the soil, it’s the place our bodies are all going back to one day, why would I want to go to war with it. I want to use inputs that build the soil’s vitality, as opposed to inputs that poison and destroy its microbial life. Can you share one personal experience or relevant anecdote that informs your TEDx talk? In 1993 I was a decorative painter by trade and avid gardener, yet wanted to farm for a living. I had no land or equipment to do so while living on a 7000 sq ft urban lot that I gardened. My wife – while pregnant with our now 18 year old daughter – was craving sunflower greens. When I saw that my wife was buying all of them and getting annoyed that the grower wasn’t replacing them on the shelf quick enough I decided to grow them. We liked them so much we thought others would too. Today we are the largest compost-growing sprouter in the state, all thanks to my daughter in the womb for getting Mom’s attention while showing Dad the way to farm and make a living on 2000sq ft. Being an agriculturist, I make a living at growing and supplying my family and the community with food. I know in order to minimize my inputs, sustain resilient soil vitality while consistently producing, I need to practice and be aware of the importance of recycling Maui’s nutrients. Since we are the furthest land mass of any other in the world, it is not economically practical to ship in what we don’t need. We live here in Paradise on Earth, my question is what paradise do you know that imports 90% of its food? younger self, give to the older you? Be your passion – it’s the most important practice of your life. Nurture the physical, mental, emotional and spiritual relationships associated with that passion and have fun in the process. TED talks have enlightened, inspired, educated, and heartened me on many levels. My favorite is “Willie Smitts restores a rainforest“. Don’t have your tickets yet? What are you waiting for?